Lovingly hand crafted linocuts of your cat or kitten, including the original plate to reprint or get creative with. I'm a designer and illustrator and have recently rediscovered my joy for printmaking and often use cats and dogs in my work. Inspired by Kickstarter (it's such a fun collaborative place), I thought "Wouldn't it be great to get a personalized print of your favorite pet? ...and why don't I make that happen!" 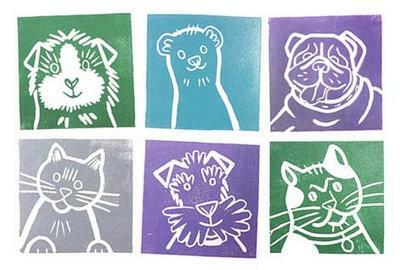 The aim of the project is for me to make a painstakingly hand carved linocut of your pet. Then to send a hand pulled print to you as well as the linoplate. You can have fun making more art prints or even convert into a 'rubber stamp' to use to your heart's content! You could use it to make greetings cards, Warhol style art, all sorts. Have fun with original art! I'm really looking forward to creating these little illustrations and think it's going to be as much fun for me creating them as for you receiving them!